The last male white Rhino in the world has died at 45 years of age. The rhino, named Sudan, had been suffering from age-related ill-health for some time, according to AFP. 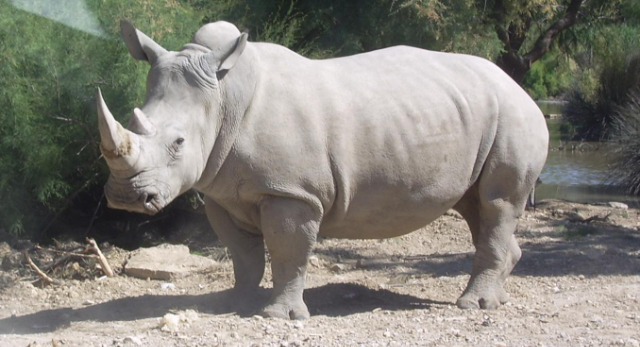 During the 1970s and 1980s the white rhino was damn near wiped out in Africa, thanks to the high demand of its horn for use in dagger handles in parts of Yemen and as a medicinal ingredient in China. Sudan's death all but cinches the death of the white rhino sub-species. Early in the new millennium, the species was nearly obliterated in the wild, as the few remaining white rhinos, numbering perhaps 20 to 30, were killed in the crossfire of the First Congo War, among other conflicts, in the Democratic Republic of Congo and Rwanda. With Sudan's passing, you'd think that the fate of the white rhino would be cinched. And you'd be right--theoretically.